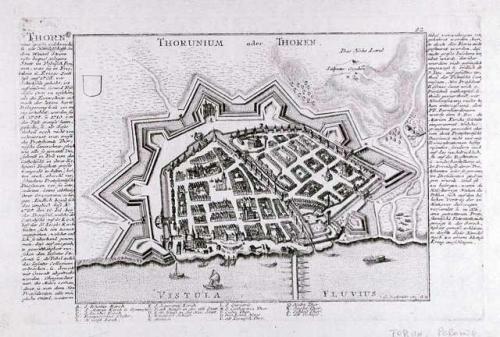 Bird's-eye view of Thorn (Torun). The original fortifications were built in the 13th century by the Knights of the Teutonic Order (The Hospital of St. Mary of the Germans in Jerusalem) who were invited to Poland to help subdue the pagan Prussians. A description and key has been engraved to both sides and below the image.